Laco Quartz “Squad” model 86 2014 after 3 years. Looks as good as the day I got it I have to say and is one that does get a fair bit of wrist time as it’s so comfortable on it’s third party Silicon deployment band. Laco tend to make more Automatic models than quartz, but bang for buck their quartz models really take some beating. One of the reasons and their are a few, that I like Laco, is their good quality build and choice of movements, quartz or otherwise. This neat 40mm x 9mm Squad variety has the excellent Swiss Quartz ETA F06.111, tucked away nicely in the very well made and solid brushed stainless steel case with it’s slightly oversize anti-clockwise unidirectional and beautifully milled bezel. An excellent AR coated mineral crystal makes the dial clarity something special as the matt black is in high contrast to the highly luminous hour markers and Superluminova C3 hands. Laco Superluminov C3 – simply the best at night. 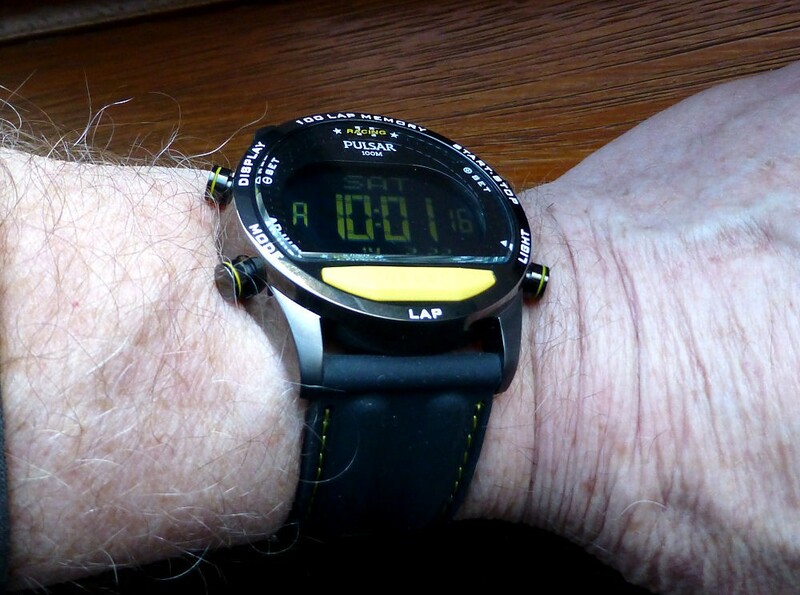 This in fact one of the best luminous watches I own and assisted by the rather long minute hand which makes reading the time at night so easy. (Breitling managed the same trick by instead extending the minute hand past the pivot point). 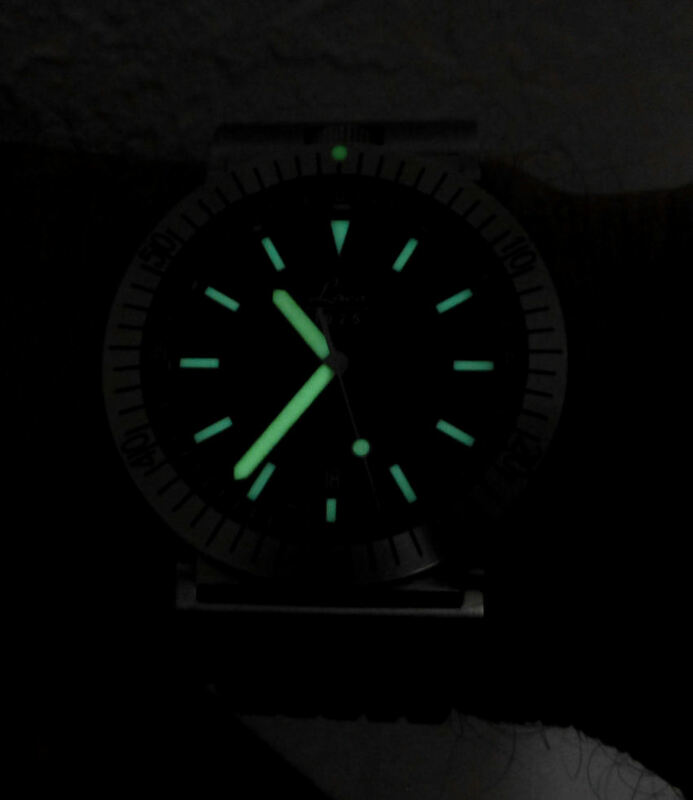 The second hand luminous DOT as you see in the image also shows very clearly in total darkness as does the Divers bezel DOT. 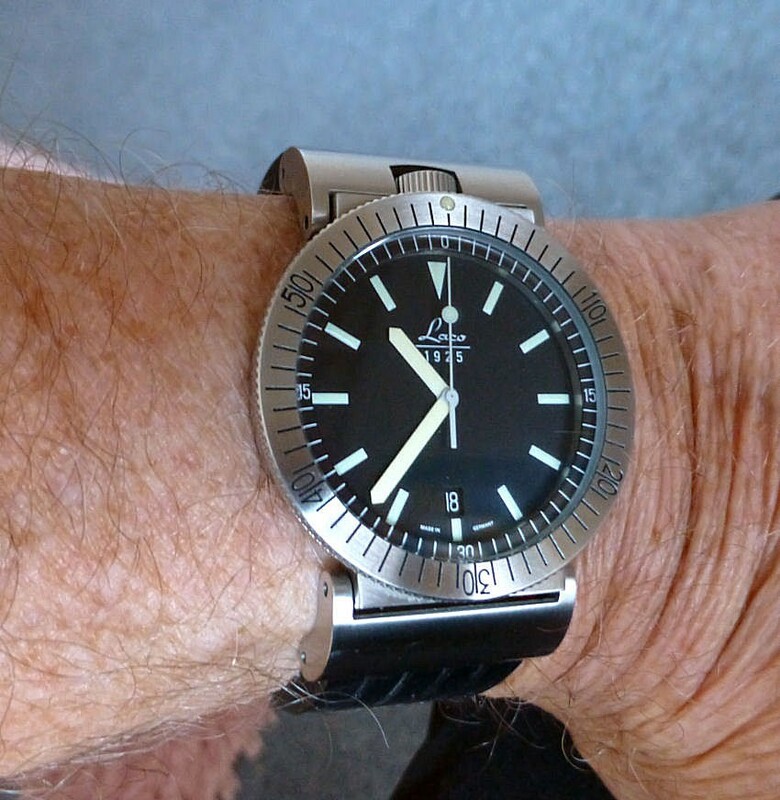 The case design is also slightly different in that it features a “bullhead” style, with the screw down crown @12 and cleverly protected by the great articulated lugs, which in turn make this watch easily worn on the smallest wrists amongst us. I wish others would use this idea as it is so simple and effective. The Date window @6 is small yet the choice of font and size plus the excellent contrast is surprisingly easy to see. Water resistance is very good at 200 metres, assisted by the screw down crown. A luminous dot on the bezel is another typical divers touch. 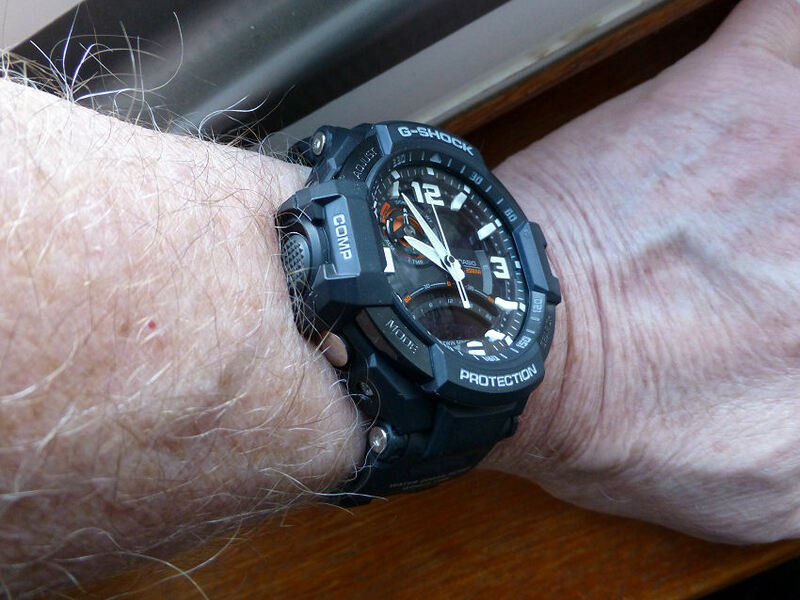 Though as said I did change the band as the Divers style one wasn’t for me – being too aggressive on the wrist – fine for a neoprene suit but against my old wrist, not so great. The alternative silicon deployment one is perfect and having standard lug/strap fitting was a simple replacement. 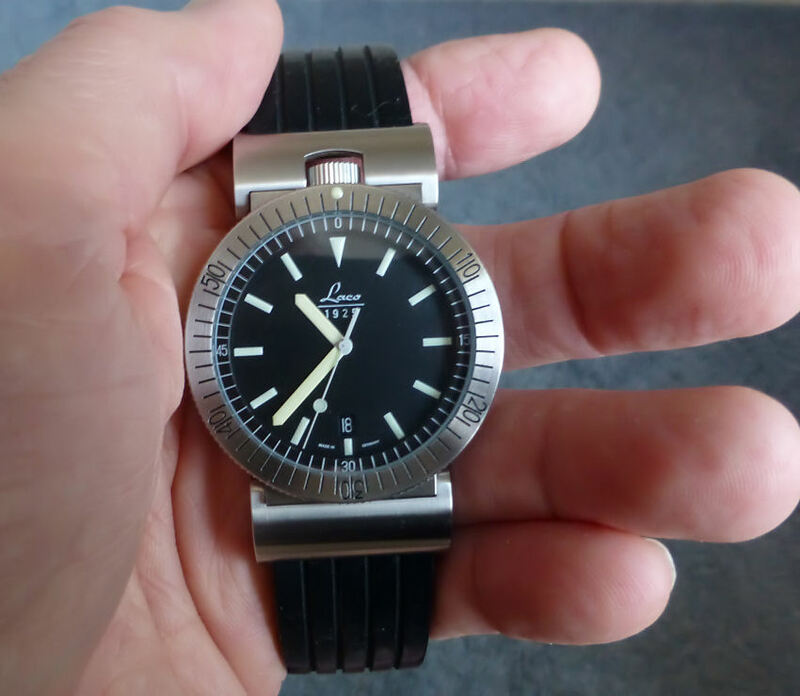 Laco with articulated lugs on the wrist. Laco make fine watches and have done so since 1925 (hence the Logo) and tend more specialist in Pilot style models. Others do copy, such as the Aeromatic brand but take it from me, not in the same league. You can find Laco easily with a simple Google search and they have a pretty decent range of models, though to find a quartz one is not quite so easy and as a price to quality ratio they are in my opinion pretty hard to beat. As promised here is an update regarding the alternative strap arrangement on the Pulsar. The original strap which is reminiscent of a tyre tread as a wrap fitting at the case lugs – ie – it almost grips the case in a pincer grip. 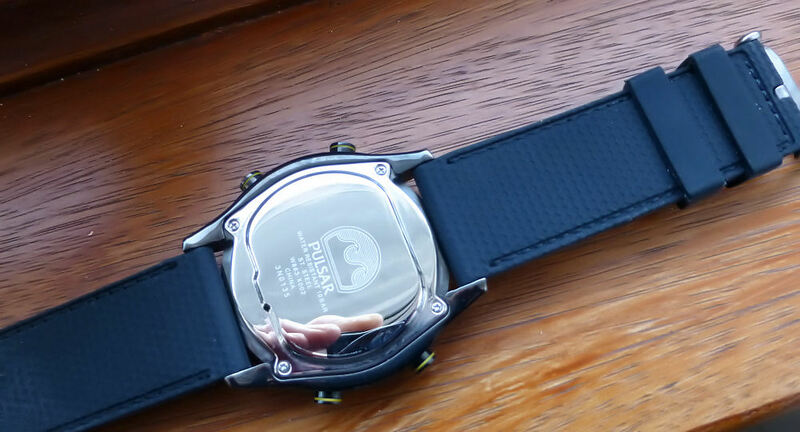 This in turn causes the strap to push the watch out a little from the wrist, on an already rather thick case. The strap is also rather hard and stiff which I find a little uncomfortable. The replacement is a black silicon rubber double ridged 26mm wide and 6.2mm thick at the watch lug end which suits this large watch very well. 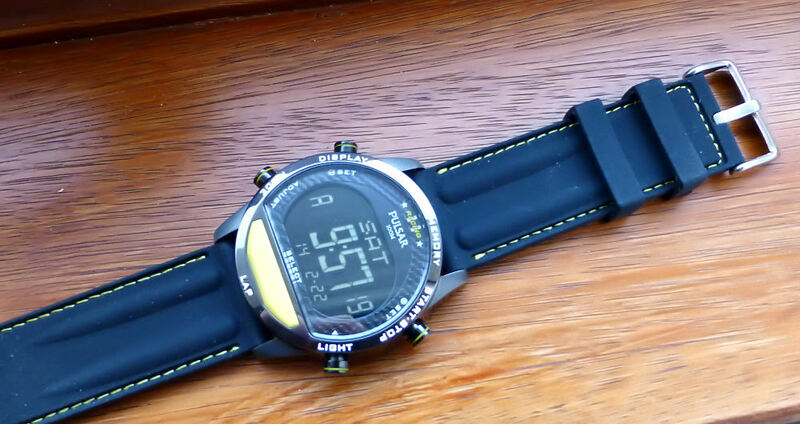 It tapers down to 4.4mm thick at the buckle and has highlight yellow stitching which compliments the yellow accent on the pushers on the Pulsar case front. Alternative 26mm soft flexible silicon buckle strap from Weston Straps UK. This is the first strap of this type I’ve bought and very impressed with it as it is extremely comfortable and now makes the wearing of this large Pulsar just perfect. Having a relatively small wrist I had to add an additional hole for the buckle to fit, which was easy enough to do. The only down side is the buckle end is 25mm wide (only a 1mm taper) and the original Pulsar buckle is 24mm (the standard Pulsar strap is a 26mm with a fast taper to 24mm buckle fit, so presently I’m using the 25mm buckle that came with the strap. Silicon double ridge with yellow stitching. The strap whilst it’s smooth on the outer surface with the twin ridge definition, has a textured surface underneath against the wrist. Just enough to give added grip without discomfort. They also have a presence on eBay and if you’re struggling to find a strap to suit, they may well be worth a look as they ave a pretty wide range of good quality and sizes available. Anyway as you can imagine I am delighted with the result and it does solve an issue that many folks have mentioned to me in the past. 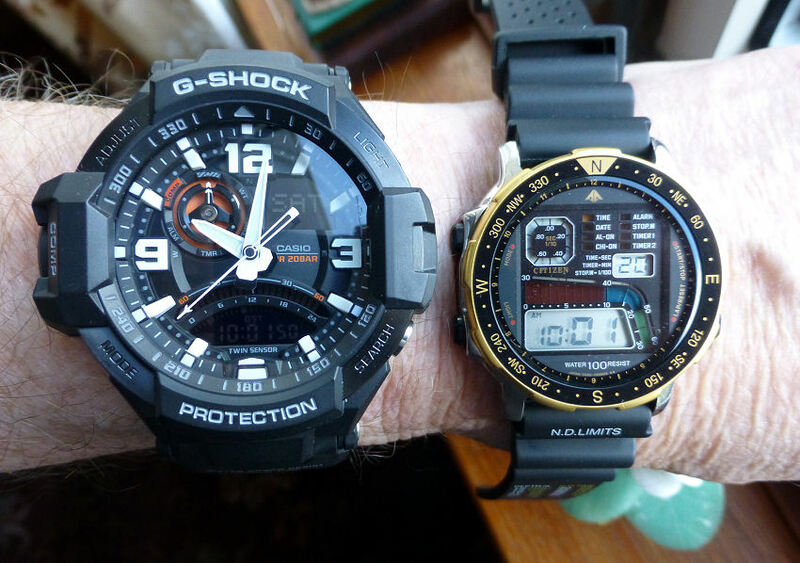 And this is especially with large watches and Diver or Military models, as they often provide straps that ,may well look good or even “macho” but when it comes to actual comfort, they seem to have given it little consideration. Many of the models come with very hard and stiff leather straps or 8mm thickness plus and frankly these are often very uncomfortable in the extreme. Just make sure you keep the original as if you do come to sell it on, then you can fit it back on the watch – and being unused – the buyer gets a great strap and you get an enhanced price. Winners all the way. Underside of the strap is textured gives added grip – without discomfort. Almost but not quite the same as in the old days when you got your first car with leather seats! The first thing you did was to cover the seats in plastic, to protect them! 2 years later you sell the car and the buyer gets this car with the most pristine leather seats you can imagine – is that not sick or what! 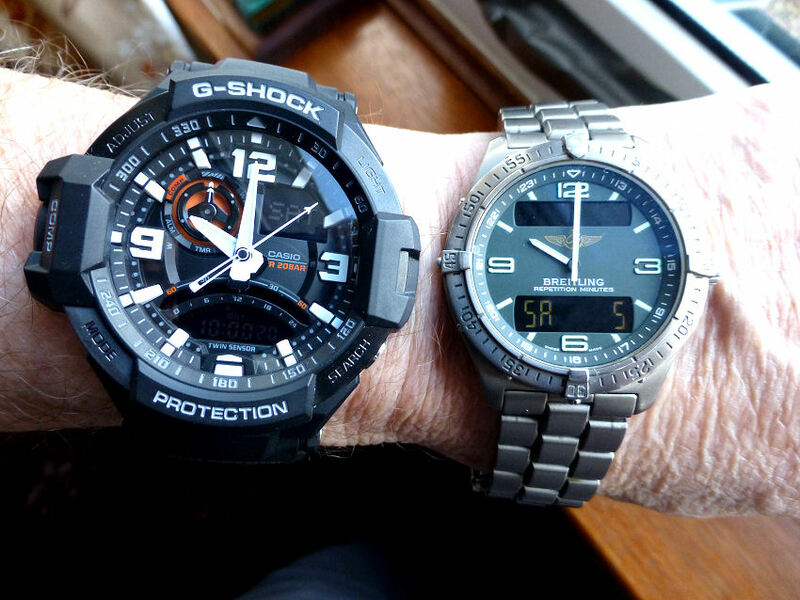 You never even sat in them . . . . . .
OK not the same I know, but with watch wearing – comfort is no small consideration and if the strap is not comfortable – change it.